The vermin horde spilled directly out of the north, tumbling in from the craggy mountains and harsh badlands, murder on their hateful minds. The valiant Mouse Guard came from the west, moving to secure the River Camp before joining the fray. 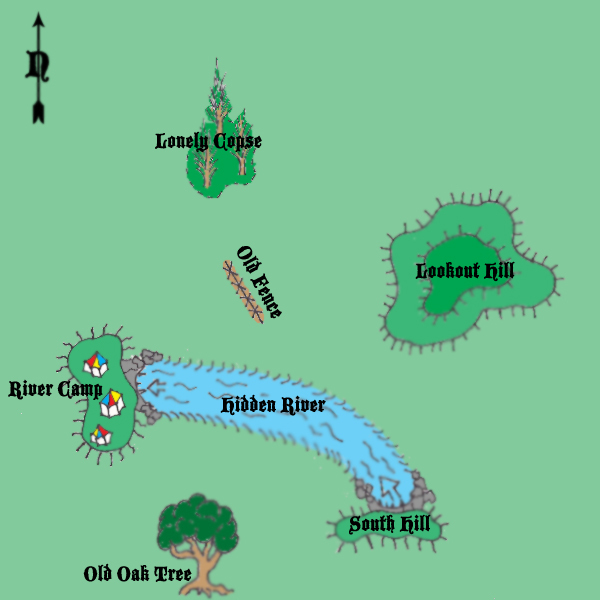 Finnegan the Blade’s otter tribe used the Hidden River to arrive, deploying just on the south side between the Hidden River and the Old Oak Tree. Captain Rabscuttle’s Wide Patrol bounded in from the southeast, coming between Lookout Hill and the South Hill. The four armies were on a collision course; the villainous rats and their murderous champions had to be stopped! The Vermin Horde had the initiative! Their main force pushed directly into the Oak Tree Down, moving between the Lonely Copse and Lookout Hill. 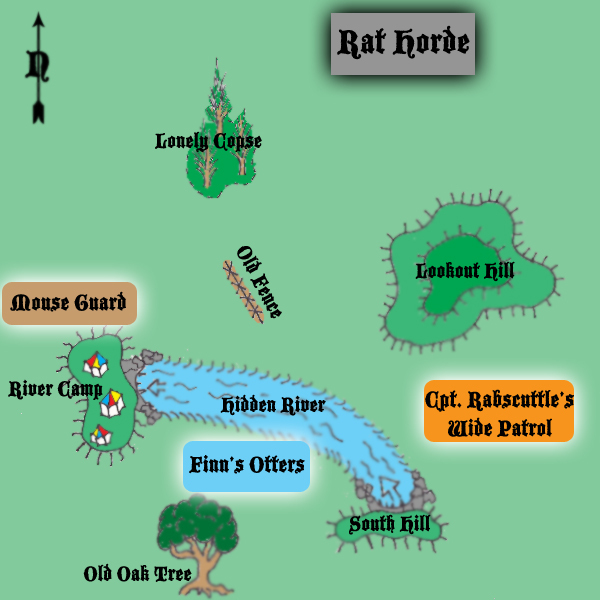 Flankers were deployed, Skurr and some rat bodyguards moved toward the Lonely Copse, while a lone sword-rat moved toward Lookout Hill. The main force formed a skirmish line of rat slingers supported by the heavily armored Durge, a ferocious anti-badger wolverine. Rabscuttle’s Wide Patrol, consisting of Captain Burdock Rabscuttle himself, Sgt. Bounder the spear-hare, and Cpl. Dand-0 Flatfoot the archer-hare, moved around Lookout Hill to plant themselves before the Hidden River in an attempt to head the main force off and join forces with Finn’s otters. The Mouse Guard had trouble mobilizing effectively, stringing themselves out from the River Camp to the Old Fence. Finn’s otters, consisting of Finnegan the Blade himself and Fletcher the archer-otter, linked up with the hare Wide Patrol on the north side of the Hidden River. The two forces consolidated momentarily and traded some ranged volleys with the rat-slingers of the Vermin Horde. The Vermin Horde approached cautiously while the Mouse Guard tried to consolidate and move toward the Lonely Copse, though “Mouse Captain the Inevitable Martyr” moved far out ahead of his reluctant troopers. Shooting from the cover of his friends, Fletcher the archer-otter managed to put an arrow into the face of a rat-slinger. The wretched creature’s death throes were horrific, causing the bulk of the Vermin Horde to lose faith momentarily. Durge the wolverine-champion stood fast while the rats of the Horde rallied to Rufur’s banner, though there were some deaths in the panicked stampede. Gripped with righteous fury, Finn, Burdock, and Bounder charge toward the isolated Durge in an attempt to overpower him while his messmates were cowering around the banner far behind him. The Mouse Captain, in his own battle fever, moved into hand-to-hand with an elite sword-rat at the edge of the Lonely Copse. Finn runs through an elite sword-rat, the only one who stood with Durge, while Burdock and Bounder fail to find a gap in Durge’s heavy armor. The fortunes of war change dramatically, with the Mouse Captain pushing back his quarry, only to be transfixed and slain by Skurr’s foul magic and his bodyguard. Captain Rabscuttle is dealt a mortal blow by Durge, falling dead in the midst of battle. Dand-O Flatfoot manages to hold his own against four rat-slingers who have returned to support Durge, but cannot strike true. Durge knocks Finnegan down and slays him mercilessly, leaving Fletcher to carry on alone. Sergeant Bounder pushes in, and the two are deadlocked in the middle of the field. The Mouse Guard is struggling to regroup, their movement slow and their troops discouraged by the death of their Captain. The Vermin Warlord Rufur moves in after Fletcher, knocking him down. Fletcher manages to regain his feet, but while trying to get his distance Rufur takes advantage of the otter’s momentary distraction and runs him through, disemboweling him gruesomely. Seeing their chance, the Vermin Horde surges forward, lead by Durge, who makes straight for the Old Oak Tree. Meanwhile, at the Old Oak Tree, Finnegan the Other Blade arrives out of the south, touching the Old Oak Tree for luck before moving to meet the foul Durge. Rufur shoves a Mouse Guard trooper into a tree at the skirmish at the Lonely Copse, knocking mouse-slinger down. Rufur takes a moment to consolidate his rat-slingers. The organization he provides them assists them in a volley, knocking Dand-O off his feet. Dand-O stands defiantly, but is too shaken to retaliate immediately. Finn the Other Blade stands in the middle of the Hidden River and issues a challenge to the approaching Durge, who is approaching cautiously, unsure of the depth and flow of the waters. The Vermin Horde maneuvers but takes no immediate violent actions, much to their immediate regret. Moving up to high ground, Dand-O sticks Rufur with an arrow while the rat’s back is turned. The violent death of the Vermin Warlord sends his rats into a wild panic. Sergeant Bounder spears a fleeing rat, then turns to charge across the battlefield. Unable to penetrate the armor on Durge, Bounder sprints across Oak Tree Down and makes a passing attack on Skurr the rat-warlock, knocking him down. Seizing the opening, a Mouse Guard trooper steps in and cuts the fallen Skurr down. Finn the Other remains in the Hidden River, pleased as he watches a Mouse Guard knock another rat down. The rolling brawl moves closer to the Old Fence and the Hidden River. Sergeant Bounder, attempting a series of running strikes, misjudges his distance and Durge catches him by the Old Fence. 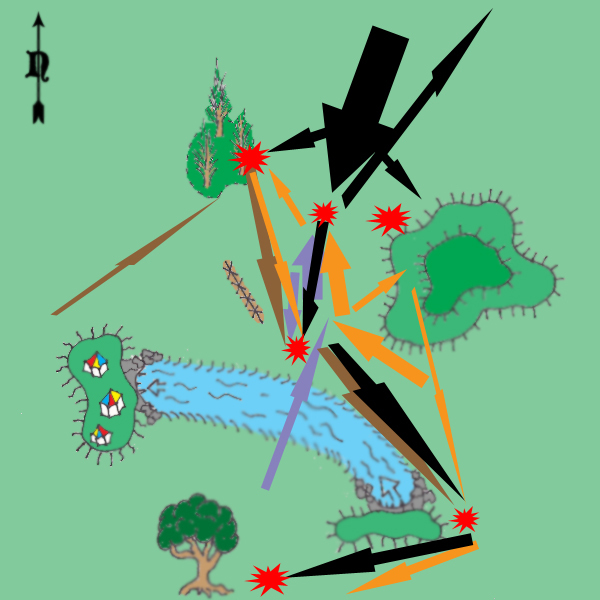 The two battle, moving their brawl toward the Hidden River. The brawny vermin hammers the valiant hare down, striking poor Bounder dead. The incensed Dand-O abandons his reason and charges across the battle field to meet Durge in hand to hand to revenge his sergeant. Finn the Other and the Mouse Guard rush in to support Dand-O, and the wolverine finds himself surrounded and set upon from all sides. Durge makes a mighty blow upon Finn the Other’s head, knocking him down, then reverses direction and rushes on the Mouse Guard. There is a lot of confusion, and everyone still left alive on the field is involved in this vicious hand to hand combat. Finn the Other makes a reckless attack and Durge slips under his guard, killing him (again). The mouse-slingers make a brave effort, but are dispatched rather effortlessly by the riled up wolverine. Durge, at last free from the woodland creatures, makes it to the edge of the Hidden River. Unfortunately for the plans of the Horde, Durge finds the river is too swift and deep for a warrior as heavily armored as he. But determined to complete his mission he heads southeast to round the South Hill and bypass the Hidden River entirely. Durge plods relentlessly on, shrugging off the arrows that Dand-O sends into him one after the other. He is knocked down several times, and the last surviving Mouse Guard attempts to time his attacks to slay that maddened beast while he is down. As Durge begins to round the South Hill he is once again knocked to his knees by a well placed arrow. Rushing in to strike him while he is compromised, the Mouse Guard makes a fatal error. Calling forth a second wind, Durge catches the attacking mouse by surprise, stabbing him in the gut as he rises to defend himself from the mouse’s opportunistic blow. Durge trudges on with Dand-O following just out of his charge range, shooting arrow after arrow into the beast’s armored back. The Old Oak Tree is under attack! Covered with blood, much of it now his own, and decorated with dozens of arrow shafts from Dand-O’s bow, the weary champion begins to chop down the iconic tree. Dand-O Flatfoot is the only woodland creature surviving, and all he can do is loose shaft after shaft as the relentless wolverine hacks away. Durge swings with tired limbs, stumbling as arrows thud home through his armor and into his thick hide. Dand-O believes Durge is dead several times, but the wolverine still struggles to rise, sometimes making it to his feet to take yet another strike at the Old Oak Tree. Three fourths of the way through the mighty tree’s trunk, blade raised to deliver the final strike, Durge stops. He has been struck too many times. A final arrow slams into his hide, his armor torn and full of holes. It’s too much, and the relentless Vermin champion finally falls dead.